by Bill Dwight on Thursday, May 21, 2015 at 11:57 AM | LEAVE A COMMENT! Joe Saul-Sehy hosts one of the most popular podcasts in the personal finance space. It’s called Stacking Benjamins, and it’s been at the top of my Stitcher favorites list for weeks now. Joe and his co-hosts magically transform normally bland finance and investing topics into chuckle-worthy entertainment. That’s no small feat. When was the last time you caught yourself guffawing over qualified retirement annuities? Yeah, never. Needless to say, I’m a huge Stacking Benjamins fan. So, when Joe emailed me a couple weeks ago to be on the show, I was beyond thrilled. No money. Don’t give your kids access to any of their own money to manage. Make sure they get zero practice making financial decisions. Just buy whatever they need (or want) whenever they need (or want) it. Make sure they have absolutely no skin in the game. Take care of everything yourself, and you might just take financial helicopter parenting to the next level — maybe even drone status. Don’t worry: when your kids have to manage their own money as adults, they’ll just immediately “get it”. No budget. Conversely, fork over unlimited amounts of money for your kids to carry around. Make sure they never have to deal with that pesky constraint known as a “budget”. Yech, the B word. Ridiculous. Need a role model? Consider Michael Jackson. He “reasoned” that a stack of Benjamins totaling $20,000 for his 3 and 4 year old kids was about right for an outing to the mall. Kind of a tight wad if you ask me. No work. Make sure that you never make the connection between money and work for your kids. Regale them with tales of magical money trees and well-deserved inherited wealth. Summer jobs for your teens? Never, never, never. They might be asked to do menial tasks that are beneath their advanced intelligence. The horror. Some uncaring boss might even yell at them. Are you really willing to risk your kid’s fragile self-esteem to instill some abstract concepts like “work ethic” and “compensation”? Nope. No interest. Whenever your kids get a birthday check, march them right down to the bank and deposit it in a traditional savings account. At the end of the year, try to remember to tell your kids about the incredible 1.3 cents in compound interest they’ve accumulated through their extreme sacrifice. Never match their savings, and never, ever augment their returns with a parent-paid interest rate that compounds in time frames and amounts that a young kid might actually appreciate. Be sure to never expose your kids to any investment concept that might yield more than a fraction of a percent of return. Your dedicated austerity in this area will undoubtedly inspire a lifelong habit of diligent saving and investing. If the stubborn among you insist on teaching your kids about the demonic stock market, be sure to teach them to buy only individual stocks that sound really cool. Never let them hold those stocks too long. That would just be selfish or, worse, prudent. Make sure your kids know diversification and long term investing are strictly for sissies! No discussion. This is by far the most important one. Never, ever discuss matters of money with your kids. Stay mum on how debit cards, credit cards, student loans, online banking, compound interest, paychecks, Roth IRAs and other silly financial things work. Just because your 6 year old knows more about computers than you doesn’t mean she can handle these abstract financial concepts! Kids really aren’t all that smart or capable of learning. Besides, when they’re old enough, their friends will teach them everything they need to know about good money habits. Fellow teens, with their under-developed frontal lobes and carefully honed perspectives, are perfect peer mentors to each other in this department. Parents need not intervene. What could possibly go wrong? Want to hear my personal family money stories and see how well they fit with the points above? 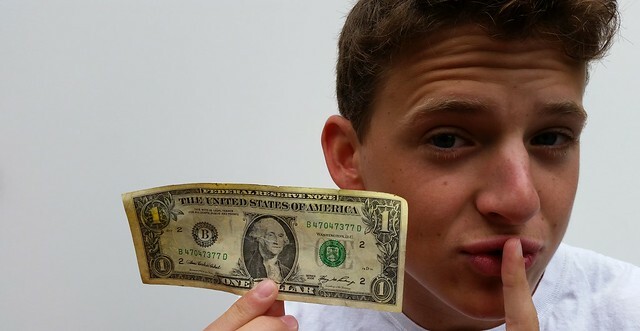 Check out the Stacking Benjamins episode here. Perhaps not as hilarious as qualified retirement annuities, but I bet you came away with a chuckle or two.